The God and Goddesses of War. You still haven’t recovered from a battle that defeated you, and it’s still really painful, isn’t it? The World and The Moon being circular cards and both reversed, indicates a sense of infinite cycles you can’t escape from. Your emotions could be continuing to spin and spin and spin, but you haven’t found it in you to confront them and end their cycle, yet. You can’t continue to reject your own growth because of this deeply imbedded loss you had to experience, beloved. Yes, I said “had to.” Because even the God and Goddesses of war must lose a battle here and there from time to time. Why go in circles, beloved? I thought Rams confront things head on? Beloved. Ultimately, with Death being reversed in your outcome position, and the World being reversed in your energy position, the Universe desperately wants to bring you an ending, and a beginning. You alone are what’s in your way. You beloved, you. Do you want to be happy? I know you do. So, what’s with all of this resistance to your emotions? The Queen of Wands serves as the basis of who you know you are. Who you know you’ll always be. You are powerful, intuitive, enthusiastic, and a leader by nature. This full moon in Sagittarius is shining a light on all of the pain you are still harnessing inside of you. Beloved, you can’t pretend and fake your way through strength, if deep down inside you’re still wounded. The 10 of Swords reversed with the Moon reversed is an absolute refusal to acknowledge your own pain or vulnerability. Something ended in your life that threw you in a mental space of calamity, confusion, sorrow, and possibly even some delusion. This emotional and mental pain you have experienced is still lingering in your subconscious mind. The Hanged Man when in the reversed position, appears to be standing straight up, rather than how he appears to be in the upright position, where he is actually hanging. Weird, right? This is one of the most complex cards of the Tarot. This card in your reading is saying that you beloved, are not as in control as you pretend to be. This phase of your life has been constructed by the Universe, and the Universe alone. And until you give it the credit it deserves, it will not release you back to your jolly and fiery life. The Hanged Man, I would generally refer to as the card of an initiation or a transition period. When it is reversed, I see this as a refusal to acknowledge the situation you’ve bene put in. You might be telling yourself, “I can fix this, I’m over this” etc. And this omnipotent behavior is an illusion, beloved. You cannot reject the lessons the Universe decides to send you. One of Aries greatest talents is their ability to fool everyone around them, including themselves. Not because you’re a liar, or a deceitful type of person, but because you would rather die than show how sensitive you really are. Even an Aries that is dying inside, could still be the life of the party. And this habit, beloved, ultimately hurts you most in the end. You’re not indestructible, and you don’t have to pretend to be for the sake of those around you. You are not the poster child of bravery. Even though you may feel like you are. We all know you’re human, beloved. And in fact, we wish you would show us more often how you really feel. We’re all dying to know you. You know, really, really know you. Beloved, you are not the ruler of time. You cannot rush healing. You cannot rush experiences. You cannot rush anything. Beloved, if you set an intention on this lovely full moon, let it be this: Patience and peace. Your fierce desire to move beyond this pain as if it never happened is in fact slowing down the entire process. Allow yourself to heal, beloved. You may have been able to swiftly get yourself out of some situations in the past, but the emotional consequences are now completely caught up with you, and this specific wound is different. There is no escaping your vunerability this time. You can’t escape your emotions. You can’t suppress your emotions. You can’t deny your emotions. You’re at a place in your life where you’re standing tall and proud, not a visible wound in sight. But what nobody else can see, and even you may have gotten yourself to fall for, is the fact that you are actually flipped upside side down and standing on your head. Your reading is filled with an immense potential for healing. But as it all started with you, it must end with you, too. Until you heal every single wound inside of your pure spirit, Aries, you will not be able to move at the pace you want to move at. Make amends, beloved. Cry if you need to. Say what’s on your mind. Most importantly, surrender to what’s been sitting on your chest. Tell someone how you really feel. Get it out, beloved! It’s so heavy to carry on your own. Patience, and peace, beloved. This is what you need right now more than ever. The Hierophant upright is calling you to come back to your spiritual roots. A sacred bond is missing in your life, or maybe a sacred bond you once had, you still miss. In many ways, you are going through a spiritual crisis right now. You’re learning how to process your emotions without letting them consume you. Your healing comes first. Dropping your guard is an essential process of emotional and spiritual healing. It’s time to go within now, and really heal what’s been hurting you. Bring out your fire. The Universe is dying to give you that ending and beginning you desperately want, but it is your own refusal to surrender that is blocking all things monumental and positive for you. You can only suppress your fire for so long until it finally blows out, beloved. Begin again. But this time around, start with peace and patience. As a cardinal sign, you always finish the way you start. Start over, beloved. Remember the beginning. One loss isn’t a life of failure, it’s simply just one loss. 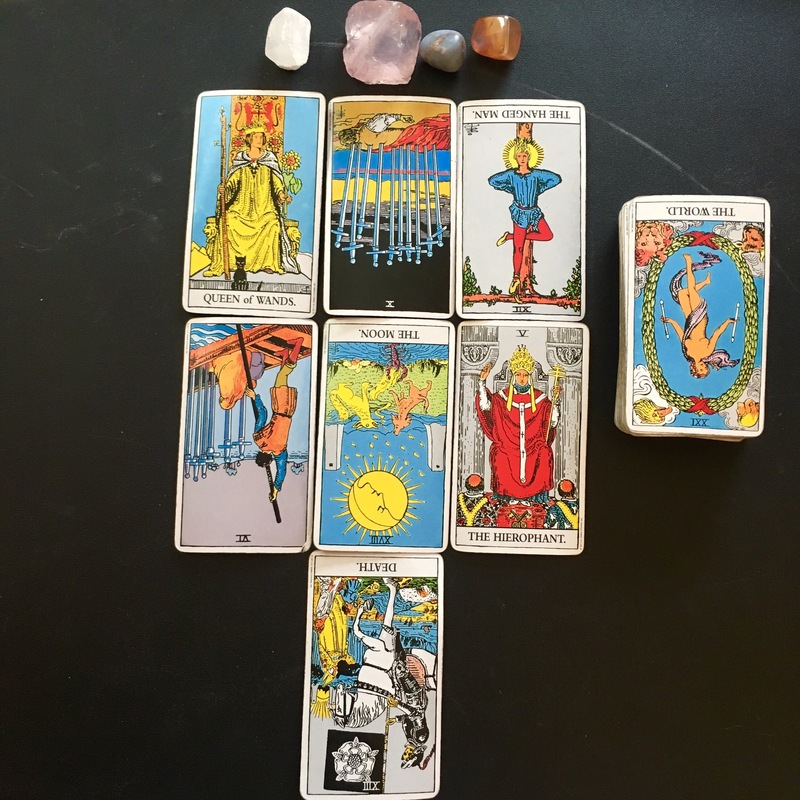 Previous Pisces: Full Moon in Sagittarius Tarot reading, 2017. Enough with the self sabotage. Take your power back! Next Taurus: Full Moon in Sagittarius Tarot reading, 2017. Nobody can compete with you! It’s time to switch up.